Wedding Band Bristol with state of the art PA and equipment! Slick, professional musicians- you can book a fully choreographed show! 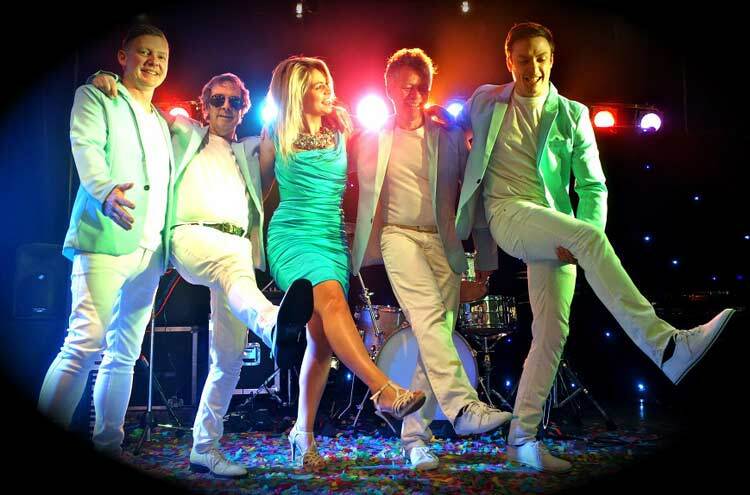 Wedding Band Bristol The Sophisticated Party Band are an energetic Wedding Band that perform to a very high standard. They put together a programme of great floor-filling songs, and perform them with a slickness and continuity factor that excites your audience, and keeps the dance floor packed! With ecstatic reaction after every song, this band know how to inspire an audience, and involve them, leaving them with no doubt that they had a brilliant night to remember. Totally self contained with high spec Sound System and amazing lighting…they also have a wide choice of stage costumes, including some really snazzy coloured suits! Sophisticated Party Band (Wedding Band Bristol) were formed 20 years ago by bandleader Martin who is not only a trumpet player but performs keyboards. Martin has always run a slick and professional programme with the band, and even from early beginnings this band had continually added to their technical specification, Repertoire, Lighting, stage costumes, also widening the choice available to clients with up to three professional female singers able to be added, and two choreographed female dancers..and the ability to cater for Themed Events! All of this combines to offer choice, flexibility and professionalism…all from one very exciting Party Band…. and culminating in a very impressive client list… Lloyds TSB, Pearl Assurance, N Power, Vauxhall Motors, The British Army, Waitrose, Tescos, The RNLI, Morrisons, B & Q, Burger King Clarke Wilmott Solicitors? Mulberry, the list goes on and on…Book now to avoid disappointment! PA/Lighting: Fully Self Contained – This act bring their own PA and Lighting for both Stage and Dancefloor!